I am a sucker for these. I will read books that I know are going to make me sad, just because the stories are that strong and compelling. Sure, I’ll be miserable for a while, but that’s fine. It’s good for us, right? Right? 1. 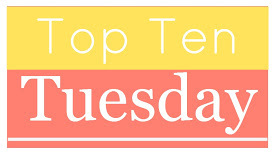 The Fault in Our Stars by John Green – I didn’t participate in this Top Ten when it actually happened, but I’m gonna guess that this book was on a lot of people’s lists that day. How can it not be? The problem is that I really want to see the movie, and I really want to re-read the book before I do. Better stock up on the Kleenex. And speaking of John Green . . .
2. Looking for Alaska by John Green – What can I say, John Green is good at making me cry. But while I knew that The Fault in Our Stars was going to make me weep like a baby (hello, it’s about teens with cancer), but the triggering event in Looking for Alaska is shocking and unexpected. And left me in a little puddle on the floor. 3. The Perks of Being a Wallflower by Stephen Chbosky – This book made me feel so many things. I felt nostalgic for my lost childhood. I felt sad for the main character once it was revealed what he was going through. I felt elated when he rose above those things and had such wonderful friends to help him. This is such a magical book for me, without being actually about magic. 4. Harry Potter and the Deathly Hallows by J.K. Rowling – I will admit that several of the books made me a little teary-eyed, but nothing will compare to the feeling I felt when I finished this book for the first time. It wasn’t even because the ending was sad (although we did loose a lot of wonderful characters – Remus and Tonks, oh my heart!!!). It was because this wonderful journey was over and I knew I would never experience another new Harry Potter book again. 5. Without You: A Memoir of Love, Loss, and the Musical RENT by Anthony Rapp – Written by someone who was with RENT from the very beginning, this is a story about friends and family and how to recover when those friends or family are gone. This is an amazing book, a must read for anyone who is a fan of the musical. Just be prepared. 6. Phantom by Susan Kay – This is probably one of my favorite books of all time. A retelling of The Phantom of the Opera, this book gives the Phantom a soul and a story and it is just beautiful. That man must have lead a tragic and terrifying life, and Kay is able to capture what he must have survived in order to be as brilliant as he was. The last sentences kill me every time though. 7. Never Let Me Go by Kazuo Ishiguro – I discovered this book in college and loved it ever since. It took a while for me to figure out exactly what was going on with that group of children, but once I did, I was shocked, horrified, and then just sad. To them, it wasn’t a mystery – they had always known what their lives were for. It was sad, but beautiful. There are my stories to make you cry! What topic did you pick for Top Ten Rewind? Let me know in comments! I have only read the first four on your list, but I agree with you completely. These books made me feel all the feels and there was so much ugly crying, especially when I read TFiOS and The Perks of Being a Wallflower. Great list! All the feels indeed. I love these books so much! Good choices! All incredibly emotional reads. I picked Childhood Favourites for my list this week. OMG. Anthony Rapp’s memoir. I read that years ago and found it so powerful. And yes, it made me cry more than once. It was wonderful. Thank you for reminding me about it. Check out my TTT and my birthday giveaway! He always seems like such a calm, professional person. It’s interesting to hear what was really going on inside his head at the time. It was such an emotional few years for him, from losing his friend to the huge success of RENT to losing his mom. But it’s not just sadness – there are a lot of quirky funny bits too. I hope he writes something else at some point. He tells a good story. John Green seems to be a master at making people cry. He’s ridiculously good at it. Great pick! I loved doing that topic too. I really enjoyed The Fault In Our Stars but I didn’t cry, which is surprising as I cry at EVERYTHING. I cried loads at the end of Deathly Hallows, that made my list too. It was so sad that it was all over. Nice list 🙂 My TTT. You didn’t cry at TFIOS??? How on earth did you manage that??? And ditto on Deathly Hallows. It was definitely more a reaction to the series being over (I’m still not completely right about that) than anything that happened in the book. Although there were plenty of emotional moments in there.